It's a classic kosher conundrum: Mashed potatoes are a classic pair with Thanksgiving turkey and gravy, but most mashed potatoes recipes contain butter, milk or cream. Therefore, how can kosher keepers enjoy a traditional Thanksgiving menu without resorting to trans fat-laden margarine and faux creamer? Pretty easily, as it turns out. Place the peeled and cut potatoes in a large, heavy saucepan or pot. Add enough cold water to cover the potatoes by 1 inch. Bring to a boil over medium-high heat, then reduce the heat and simmer for 15 to 25 minutes, or until you can pierce the potatoes easily with a fork. Drain the potatoes in a colander, reserving a bit of the cooking water. Return the potatoes to the pot and mash with a potato masher, fork, or wire whisk. Add the soy milk and/or a little of the reserved potato cooking water about 1 tablespoon at a time while you continue mashing until you achieve your preferred consistency. Season to taste with onion powder, garlic powder, salt, and freshly ground pepper. If desired, add olive oil and/or non-hydrogenated margarine to taste. Don't be shy about tasting the potatoes as you season the spuds, as you want to get it just right. Just before serving, top with (or mix in) your favorite chopped fresh herbs. Don't fret about the lack of specific ingredient quantities. Taste as you go, and use (or omit) whatever spices you like best. If you like a more rustic texture, boil the potatoes in their skins and mash them along with the potatoes. If the potatoes are small, you can leave them whole when you cook them. For better flavor distribution, sprinkle the spices evenly over the potatoes before mixing them in. Prefer to avoid soy? Try other dairy substitutes, such as almond or coconut milk. Mix a small splash into a spoonful of potatoes and taste first. You can also use the potato cooking water or chicken or vegetable broth to thin and smooth the potatoes. Starchy potatoes such as Russets make the fluffiest mash, but they're not the most flavorful of potatoes. If you want fluffy mashed potatoes with a good amount of flavor, mash up half Russets and half Yukon Golds. Don't cut the potatoes too small before you boil them. When more surface area is exposed, more water gets into the potatoes while they're cooking—and that means a less flavorful final product. Garlic mashed potatoes: Saute two to three chopped garlic cloves in olive oil for about one minute, then add the potatoes instead of the garlic powder. 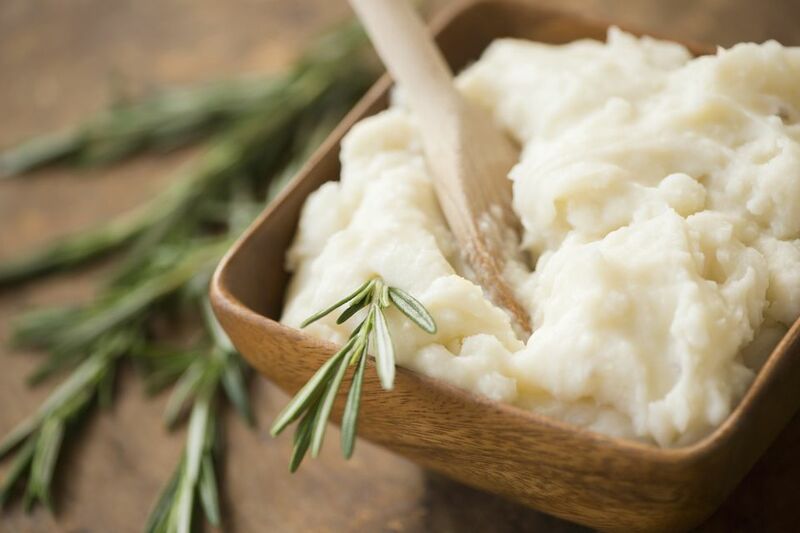 Slow cooker dairy-free mashed potatoes: Combine all the ingredients in the slow cooker and cook on low for six to seven hours. Mash with a potato masher until smooth.